Msgr. Thomas J. Kelley, 93, pastor emeritus of St. Anne Parish, Philadelphia, and a former pastor of Holy Saviour Parish, Linwood, died July 6. Born in Philadelphia, the son of the late Thomas and Mary (Sherin) Kelley, he attended Samuel Breck Elementary School, Theodore Roosevelt Junior High School and Northeast Catholic High School before entering St. Charles Borromeo Seminary. Msgr. Kelley was ordained May 19, 1951 by Bishop Hugh L. Lamb at the Cathedral of SS. Peter and Paul, and his first assignment was as parochial vicar at St. Canicus Parish, Mahanoy City. He also served at St. Ann, Lansford; St. Catherine of Siena, Allentown; St. Patrick, Norristown; Visitation B.V.M., Philadelphia; St. Thomas Aquinas, Philadelphia; St. Columba, Philadelphia; St. Colman, Ardmore and St. Madeline, Ridley Park. He was appointed pastor of Holy Saviour in 1980 and pastor of St. Anne in 1985, serving there until he was named pastor emeritus in 1998. In retirement he was in residence at St. Matthew Parish in Philadelphia. “He was made to be a priest,” said St. Anne’s parishioner Dennis Corkery. “He was quiet and gentle, not intrusive, someone you could be yourself with. He was faithful to his duties, enjoyed being of service. He was well liked, but not a pushover. He knew how to use his authority but didn’t abuse it. After his retirement he was welcomed at St. Matthew’s where he made a real contribution. It would be his home for 18 years, longer than any assignment. But mostly Msgr. Kelley “loved the opportunity to engage with people. He was just a good guy and very holy,” Msgr. McGroarty said. There will be a viewing for Msgr Kelley on Monday, July 11 at 4 p.m. at St. Matthew Church, followed by a 7 p.m. parish Mass. 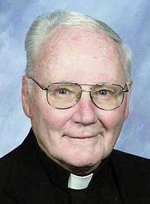 There will be a Tuesday, July 12 viewing at St. Anne Church at 9 a.m. followed by his 11 a.m. funeral Mass celebrated by Bishop Michael J. Fitzgerald, with Father James Novakowski of the Diocese of Grand Island, Nebraska as the homilist. Father Novakowski was mentored by Msgr. Kelley while in his youth at St. Anne’s. Concelebrants will include Msgr. Dreger, Msgr. McGroarty, Msgr. Joseph McLoone; Fathers Charles Gormley, Roland Slobogin, Steven Marinucci, Eugene Tully, Edward Brady and Father Novakowski. Msgr. Kelley is survived by his nephew, Donald Kelley.